The rise of microservices and containers, cloud-hosted CI/CD systems and serverless platforms give developers more opportunities to build rich and powerful services. But debugging those services is becoming increasingly complicated, and as deployment frequency goes up the mean time to recovery from problems tends to go up. Part of that is the complexity of the environment and the time it takes to deploy a developer environment that accurately mimics the production environment, including all the other microservices, containers and external dependencies, whether it’s third-party code or just code that particular developer doesn’t work on. But it’s also the difficulty of debugging against live code and being able to set breakpoints and quickly deploy code right from their development environment. Containers offer the promise of having the same environment for development and production but setting that up can be a lot of work; connecting the two for debugging is even more complex. One approach is services like Azure Dev Space, which creates sandboxed environments for developers in Azure Kubernetes Service and uses service mesh routing to sync local code with the production environment so they can debug against the live application. 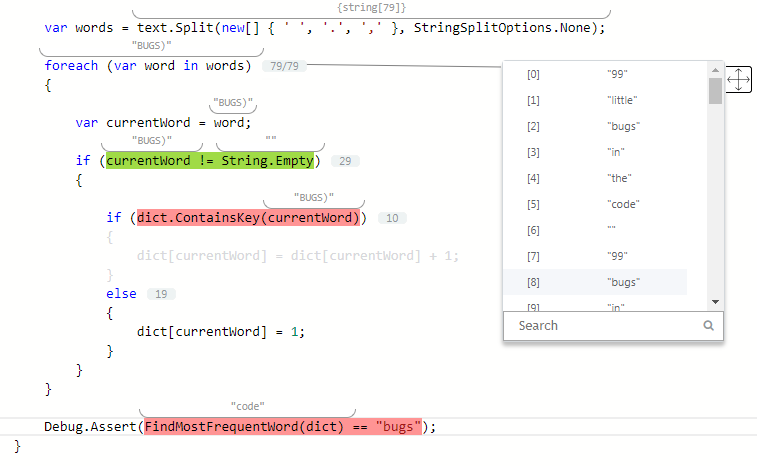 There are a lot of other environments beyond AKS where developers want a better debugging experience, which is why OzCode is bringing its popular debugging extension for Visual Studio to the Azure DevOps service (previously known as VSTS), which integrates multiple cloud and third-party developer services. 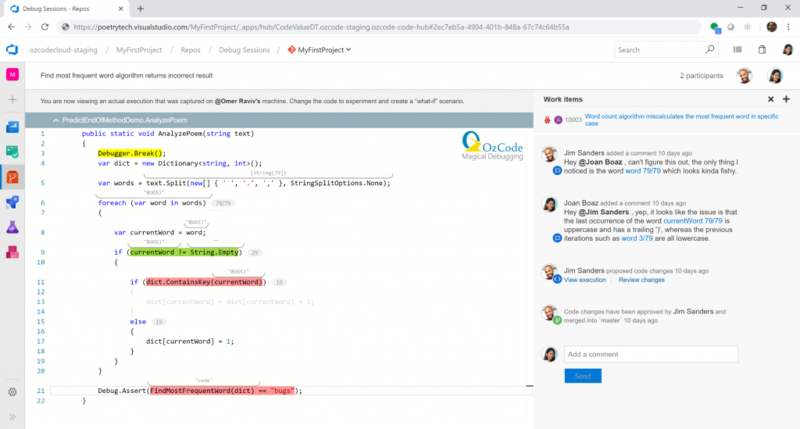 OzCode “Debugging-as-a-Service” toolset integrates with Azure Pipelines to help developers share a debugging session, including iterating through code hosted in the cloud service and trying out different code fixes before committing and deploying them. 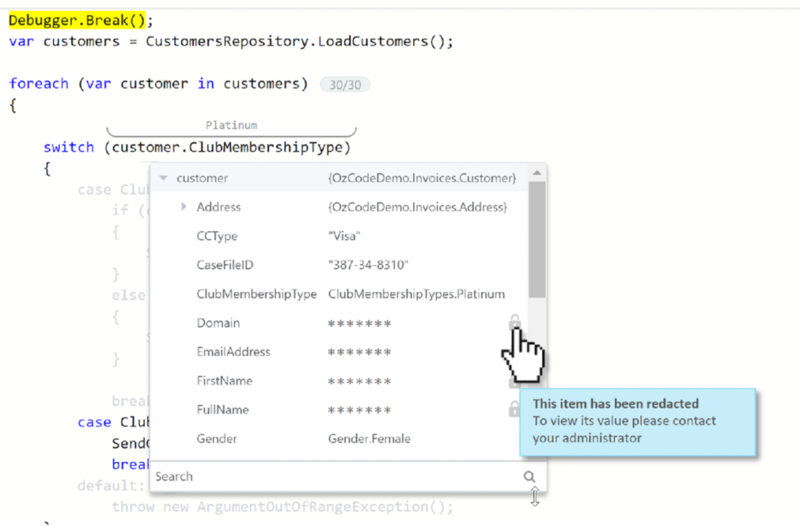 Like the Visual Studio extension, the AzureDevops OzCode tools aim to help developers doing root cause analysis — only against code that’s running in Azure DevOps rather than on their own computer. They can still step through the code and inspect memory in a rich visual debugger with scoping and color coding, looking at the contents of variables as they go. That includes all the previous values of the variable, which can quickly show which iteration through the code caused the problem. This kind of time travel debugging (which Visual Studio and Visual Studio Code users will be familiar with for local code) is a big help for finding the exact point where things started going wrong. Step through the values in a variable to understand what the code does in production. Go back and look at previous debugging sessions directly from work items in Azure DevOps. Those point in time snapshots of code execution, both of the live code and the proposed fix running in the same environment, can be shared with colleagues to make it easier to collaborate on a problem by pointing them to exactly where the problem occurs. The chat panel at the side of the cloud debugger lets developers do the usual things like adding comments and mentioning colleagues. They can also post links to a specific execution snapshot so the other developers can review it, and suggest the code changes they think will fix the bug; that shows both the diff of the old and new code side by side with changes highlighted and the execution of that code showing the change in action. Code owners can then choose to approve the code fix and merge it into the master branch for deployment. Admin policies for masking sensitive personal information keeps developers in compliance with privacy regulations. That collaboration can include as many developers as necessary; because they’re looking at a snapshot it’s not necessary to give everyone access to the production environment to collaborate on debugging. The downside of that is that everyone involved is able to see the code and the potentially sensitive personal information that’s flowing through that live production environment; crash dumps often contain information like customer email and phone numbers. The Azure DevOps integration lets you restrict access to projects and source code through the same mechanisms you’re already using for the CI/CD workflow, and OzCode also allows admins to create policies for automatically redacting the contents of variables that hold personal information like names and addresses in the cloud debugger, as well as providing an audit trail for who has seen the code and content. The Azure DevOps integration also lets developers and admins correlate bugs and debugging sessions to work items. If there are regression bugs that creep back into the code after they’ve been resolved, they can go back and look at what the problem was and how it got fixed last time rather than having to start debugging again from scratch or digging through code comments and old PRs. Feature image: OzCode’s collaboration environment combines chat, code review and interactive debugging of a snapshot of the live production environment.